You have to give a big, important presentation in just 15 minutes. Your heart is racing, your palms are damp — you're starting to panic. It's completely normal. In fact, most speakers, beginners and veterans alike, readily admit to feeling nervous in the moments leading up to a big speech or presentation. Darlene Price, president, of Well Said, Inc. and author of "Well Said! Presentations and Conversations That Get Results," says instead of trying to lose the butterflies, you should aim to leverage them. "The adrenaline surge can fuel your body with the energy and enthusiasm necessary for a great performance," she explains. Claim your success before you begin, Price says. "Let's learn from the experts in sports psychology. They've proven that an athlete's positive self-talk prior to and during a performance consistently creates a higher win rate," she explains. What's more, research suggests that using your first name or the pronoun "you" instead of "I" can make it easier to deal with stressful experiences. 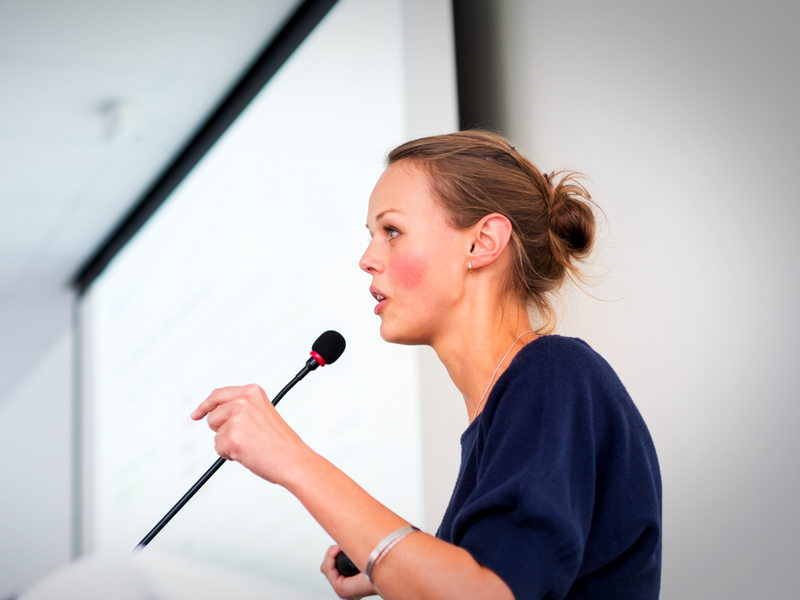 In the minutes leading up to your presentation, say over and over within yourself, "You are a dynamic speaker!" "You are enthusiastic and engaging!" "You are prepared and confident!" "Write your own set of self-affirmations and confidently declare them," she advises. "Your words will create a self-fulling prophecy." "First thing's first," Price says. "Needing the toilet when you wouldn't normally 'have to go' is a common reaction to anxiety and pre-speech jitters. Why take chances? Plan ahead and use the restroom in the moments prior to going on stage." 3. Strike a power pose. Take advantage of your alone time in the bathroom to strike what Harvard psychologist Amy Cuddy dubbed a power pose. Cuddy describes power poses as expansive and open stances where you take up a lot of space and hold your arms and legs away from your body. When you expand your body, Cuddy tells Business Insider, "your mind starts to feel more confident and powerful — it starts to see those challenging situations not as threats but as opportunities." Do some light stretching, a few knee-bends, or take a brisk walk down the hall and back to send more oxygen to the brain and reduce tension, Price suggests. 5. Take several deep belly breaths. Since anxiety tightens the muscles in the chest and throat, it's important to diminish that restricting effect with deep inhalations, Price explains. Don't underestimate the power of a long, slow, deep breath. "It maximizes the amount of oxygen that flows to the lungs and brain; interrupts the adrenalin-pumping 'fight or flight' response; and triggers the body's normal relaxation response," she says. In the moments leading up to your presentation, breathe deeply and deliberately. 6. Don't pretend you're not nervous. If you're nervous before your presentation, pretending not to be can actually make things worse. According to recent research out of Harvard, once activated, a state of arousal, as when someone is anxious, is difficult to control. And research out of Boston University suggests that hiding your feelings of anxiety from observers, which they call suppression, can actually lead to an increase in feelings of anxiety and heart rate. 7. Reframe your nervousness as excitement. The Harvard research suggests reframing anxiety as excitement, rather than trying to calm down, since both are states of high arousal. Anxious study participants who announced that they felt excited were perceived as more persuasive and competent when they gave their speeches, as previously reported on Business Insider. "Harnessing the power of the mind-body connection means that you can learn to use your thoughts to positively influence your body's physical responses," Price says. Did you get overwhelmingly nervous the last time you gave a birthday gift to a friend? Probably not. You may have felt anticipation, excitement, even joy, but not anxiety, Price says. "As a speaker, think about your presentation as a gift to the audience; a nicely wrapped package full of valuable information, helpful ideas, and meaningful content," Price says. "The mental attitude of giving empowers you and frees you. It takes your mind off of yourself and puts the focus on helping others." 9. Acknowledge the three audience truths. "This audience believes I am the expert." The audience perceives you as a recognized authority simply because you're the one speaking, she explains. "Plus, you know more than they do about the topic." "They want me to succeed." Audiences are rooting for you. They want and expect you to add value; to be interesting, engaging, and informative otherwise the presentation is a waste of their time, says Price. "They don't know what I'm going to say." If you make an error, don't announce it or apologize, just keep going. "The audience will never know." 10. Practice the first minute in your mind. Whatever you're planning to say as the captivating opener — a witty quotation, personal story, or startling statistic — rehearse the first few sentences several times, Price suggests. Knowing exactly how you're going to start gives you confidence, enables you to look directly into the eyes of audience members as you begin (not at notes or a slide), and creates a powerful first impression. 11. Sip water that is either warm or room temperature, with lemon if possible. "This helps with dry-mouth, cuts through mucus buildup in the mouth, and clears the throat," Price says. Avoid cold food and drinks, dairy products, and carbonated beverages — and ensure a glass or bottle of water is within arm's reach during your speech. 12. Meet and greet the audience before you speak. Shake hands and talk with as many people as possible ahead of time. "This shows the audience you're approachable and personable," Price explains. "You may even learn a few names, issues, and stories to weave into your presentation. Plus, having conversations with your listeners ahead of time transforms scary 'public' speaking into natural, relaxed 'personal' speaking." 13. Check out the meeting room and audiovisual set-up. As the speaker, be sure you know the environment, including the seating arrangement, presentation electronics, microphone, and lighting. Get to the room early and ensure you're comfortable with the set-up. "This step shows the audience you're prepared and helps ensure your presentation runs smoothly," she says. 14. Assume a standing position in the five minutes prior to speaking. If you're the host or only speaker, you'll be standing anyway. However, if you're one of several speakers on the agenda, and your turn is coming up in five minutes, simply step to the back of the room and stand, or stand up if you're backstage. "The sitting position is motionless, passive, and inactive. By standing, you summon energy ahead of time, give your body a chance to warm up, and place yourself in a posture ready for action," Price says. Maintain a positive, pleasant expression on your face in the moments before you speak. "Smiling actually relaxes the body. Physiologically, smiling emits endorphins in the brain that calms the nerves, creates a pleasant attitude, and promotes a sense of well being," she says. Plus, a smile conveys confidence and self-assurance. It shows your audience that you're happy to see them and enthusiastic about your message.